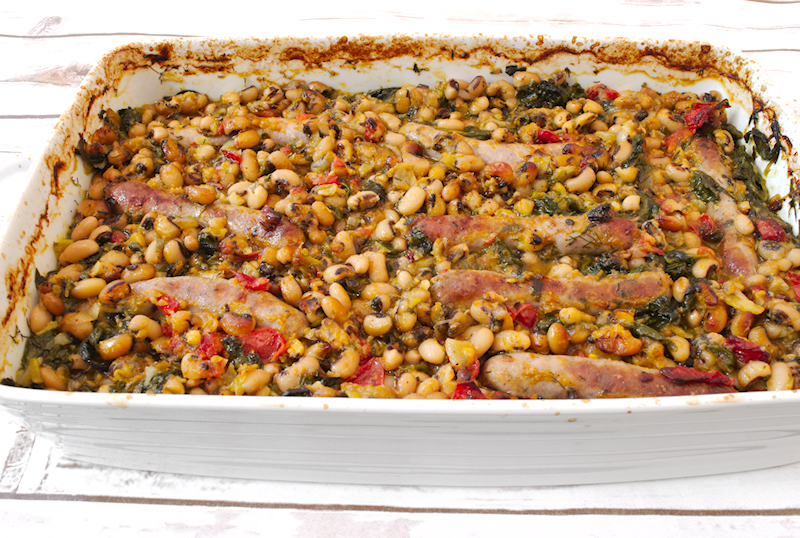 A delicious recipe for black eyed beans casserole with spinach and Chipolata sausages. Home cooking at its best! When a busy week is coming, a hearty casserole is what you need. You spend some time in the weekend but you have a healthy and tasty dinner for the next few days. It saves time, energy and, of course, money. Beans in the oven are not very popular. They are used mostly in soups and salads. However, if they are done properly, they offer a juicy and hearty meal that will impress everyone. 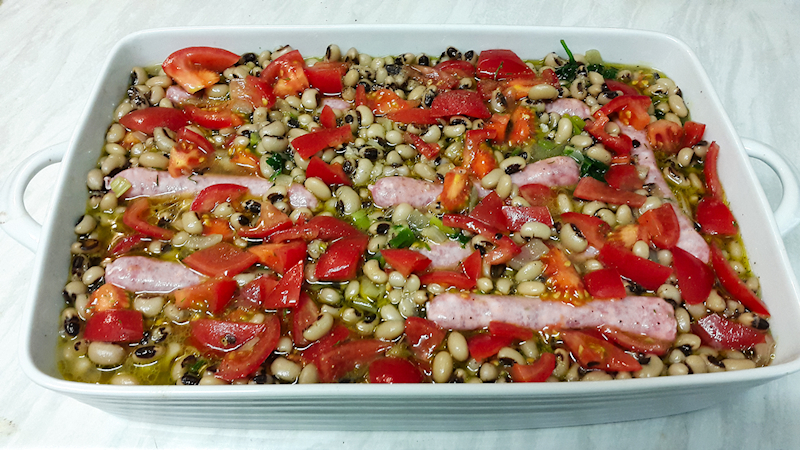 Black eyed beans are a common salad ingredient. I like them because they have this sweet particular taste. They are very nutritious but I have to say that I didn’t gave them much attention until recently. 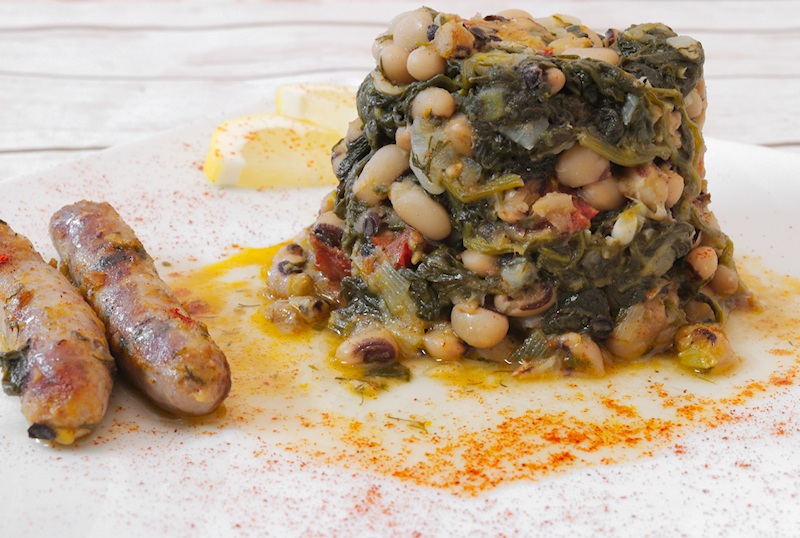 You will be surprised how well beans and spinach go together. I used fresh spinach this time and I think you should do the same if you can find it. It would be also interesting to add any other aromatic wild greens but it’s hard to find where I live. Maybe I will try it when I visit Greece next time. The dish could stand alone without the sausages but I wanted to give it a kick. I used Chipolatas but you can use any other sausage you like. 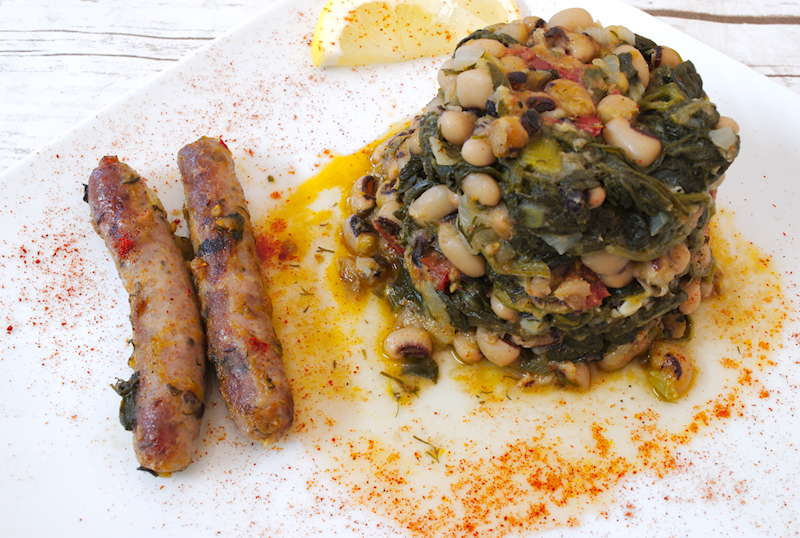 Also, you could finish the black eyed beans casserole with some crumbled Feta on top. Yummy! 300 gr (10 oz) black eye beans. 300 gr (10 oz) fresh baby spinach. A small bunch of fresh dill chopped. A small bunch of flat-leaf parsley chopped. 2 large sweet and ripe tomatoes diced. ½ cup (and a bit more) of extra-virgin olive oil. 1 ½ teaspoon of salt. Add the beans in a large bowl with plenty of water and let them overnight to soak. Add plenty of water in a large pot on high heat and bring it to boil. Add the beans and let them boil for 5-10 minutes. Drain the beans and add fresh water to the pot. Boil the beans for ~ 40 minutes until they soften and are eatable. Drain the beans and keep aside. Add 3-4 tablespoons of olive oil in a large and deep pot on medium-high heat. Add the onion and spring onion and cook for a few minutes until soften. Add the spinach and give it a good stir. After a few minutes the spinach must have softened and reduced in size. Season with salt and pepper and add the dill and parsley. Give it a good stir, let it cook for 3-4 minutes and remove from the stove.. 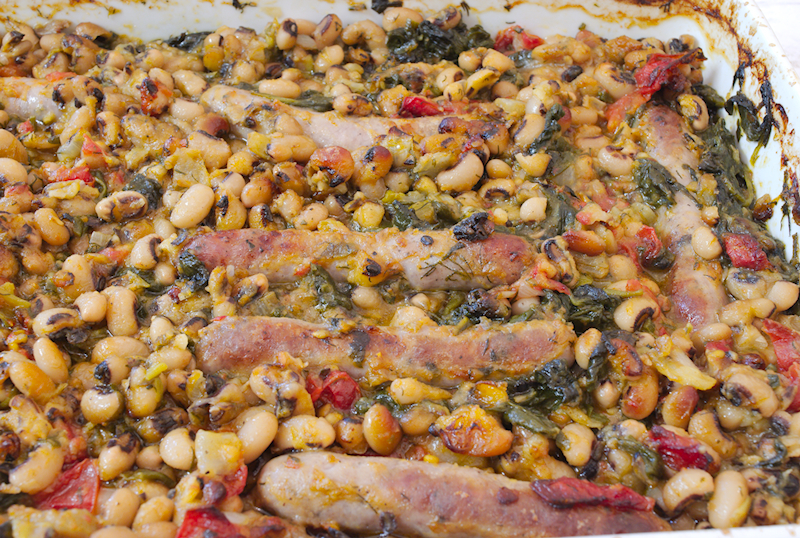 The juices from the spinach will still be there but you will use it to cook the beans in the tray. Use a medium-large tray and add the contents of the pot (onions and spinach) to the bottom of the tray. Add the beans on top and season with salt and pepper. Squeeze in the Chipolatas and pour the olive oil together with the tomato paste diluted in one cup of hot water. Add the fresh tomato on the top. Bake for ~ 45 minutes until the sausages are cooked. You may need to stir a bit your casserole if you see that the top becomes brown too soon.